has less head and leg room than the $17,000 Chevrolet Cruze, which is more or less the non-electric version of the Volt. This is actually not as bad as I feared when Jack Shafer pointed me toward Niedermeyer’s blast. Looks like a Prius? Meh. Requires premium gasoline? The whole point is that it doesn’t use much gasoline in the first place (no one buys a Volt if they do a lot of long-distance driving), so meh again. Seats four people? That’s a drawback, but not a big one for most people. And although headroom and legroom are indeed a bit less than the Cruze, reviewers mostly seem to think it’s pretty adequate. That leaves that $41,000 price tag. Which comes down to maybe $34,000 after the federal rebate and perhaps a bit less if your state also offers a rebate. Either way, it’s still a whole lot more than $17,000, and you’re not going to come close to making that up in fuel costs no matter how long you keep the thing. 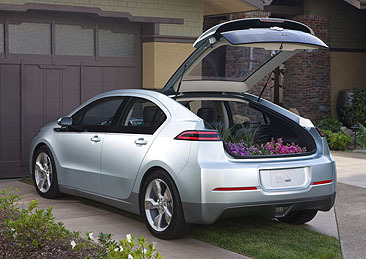 The rest of the Volt’s drawbacks may be modest (and you can add limited trunk space to Niedermeyer’s list), but they seem a lot worse when you’re paying 15 grand for the privilege of suffering through them. Not to worry, though. In the software biz we always say that nothing is ever right until v3.0. So by 2018 or so the Volt should be in good shape. Assuming that General Motors still exists by then, of course.